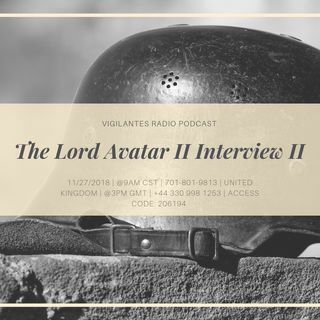 The Lord Avatar II Interview II. The podcast host of Solaran Faith, Indie Artist, Composer, Writer & Author, Ashley Ellison aka Lord Avatar II, stops by Vigilantes Radio's "Inside The Music"Series to chat with Dini about his war with the courts and his ... See More ex-girlfriend, how he plans to gain the upper-hand of this battle & the brutal truth of going to war with an ex-lover. To find out, set your reminders, it's happening! 11/27/201i | @9AM CST | Call in at 701-801-9813 | United Kingdom +44 330 998 1253 | Access Code 206194 | You can also hop in the mix by visiting www.onlyonemediagroup.com and slapping that "Go Live" button | Please follow our show at www.spreaker.com/onlyonemediagroup & remember sharing is caring! Be sure to follow our show there! Thanks for your continuous support!